Caps from the Extras: Merry and Frodo ~ happy and not so happy…. 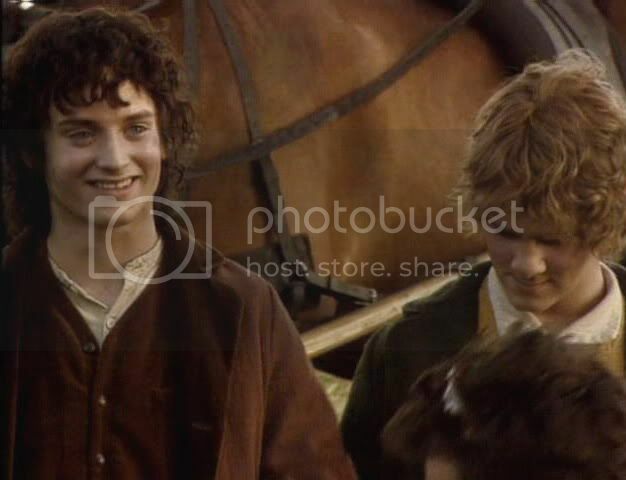 While I am doing caps of “Elijah in costume,” I thought I would go ahead and post these two strings of screencaps from the FotR TE DVD Extras featuring Merry and Frodo. I really love these two series of caps because they are so evocative of character and mood. 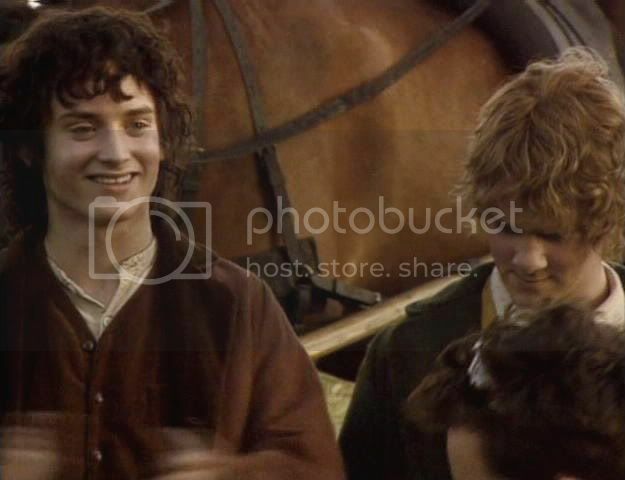 Like the "hilarious Elijah" of the previous entry, I only wish the camera had been better focussed. 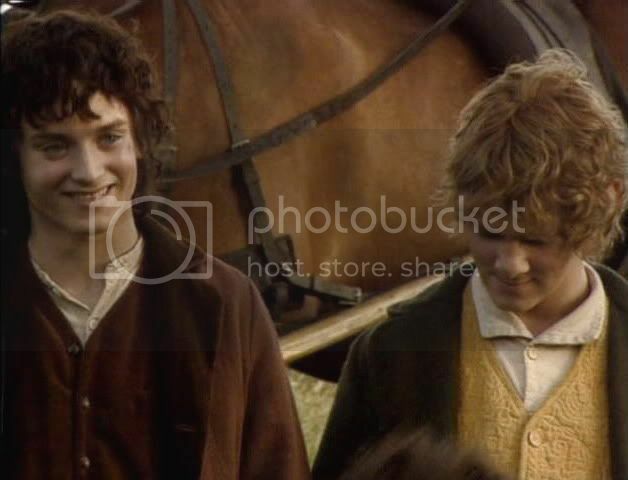 In the first set, the “happy Merry and Frodo” shots, Elijah Wood and Dominic Monaghan seem to have giggled at something while they pose. 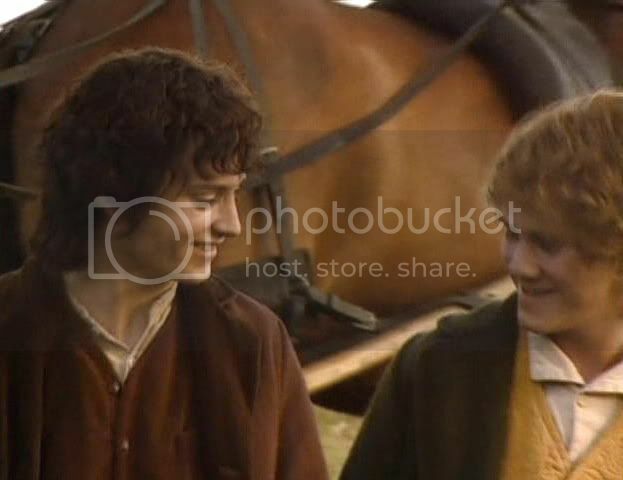 Even though they have started laughing, the two seem to have remained in character for the sake of the shoot. 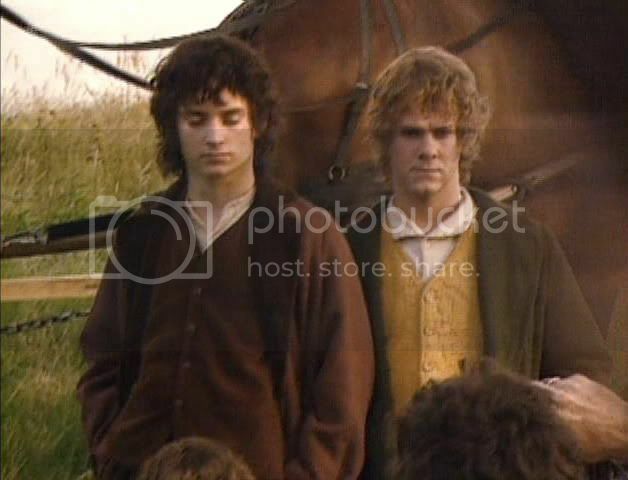 It was this sort of sequence that helped me see where all the Merry/Frodo slash fic came from. 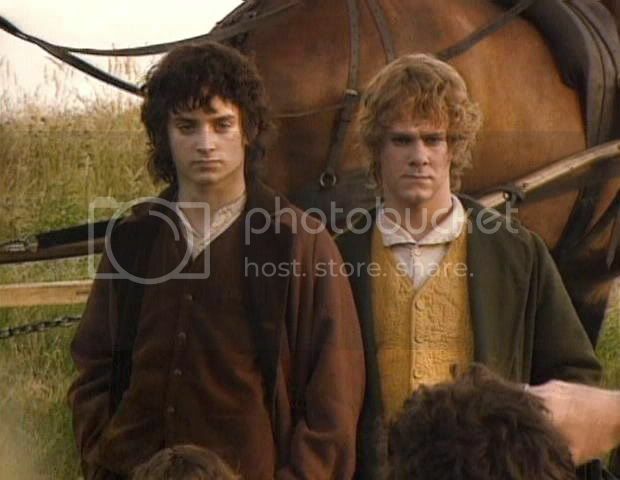 I just couldn’t see the basis for their slash relationship in the actual film, and still don't. 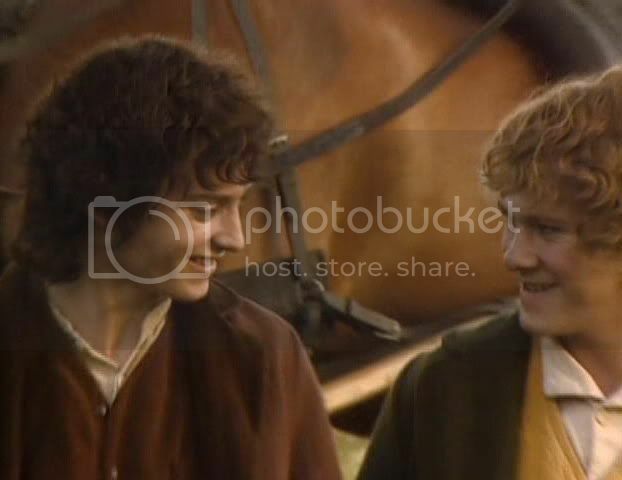 But in the Extras, the hobbit actors spend so much footage horsing around affectionately and sharing their in-jokes, it is an easy leap to imagine whole relationships, sexualized or platonic, between the characters (or between the actors, in the case of RPS’ers). The following eight caps come from the Fox TV special, but they do come from the same photo session. I really, really love these caps. 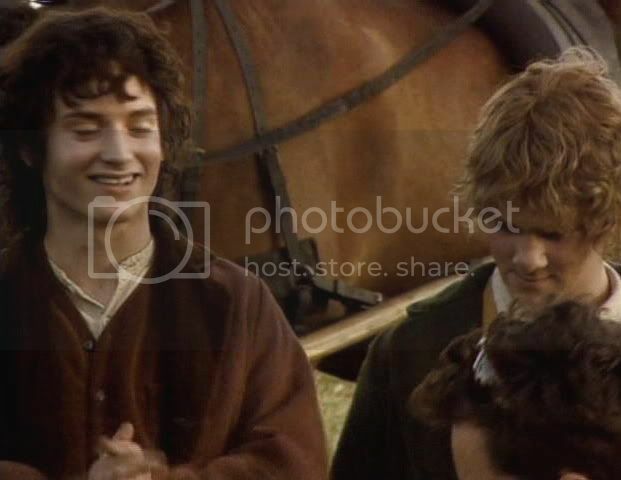 If the previous “happy” set makes me think of Frodo and Merry from before the Quest, this set makes me think of them after the Quest. 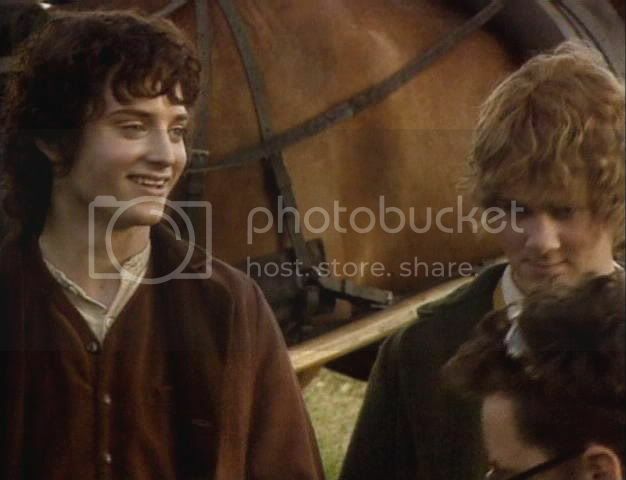 That is why I have posted the two groups together in one screencap entry. 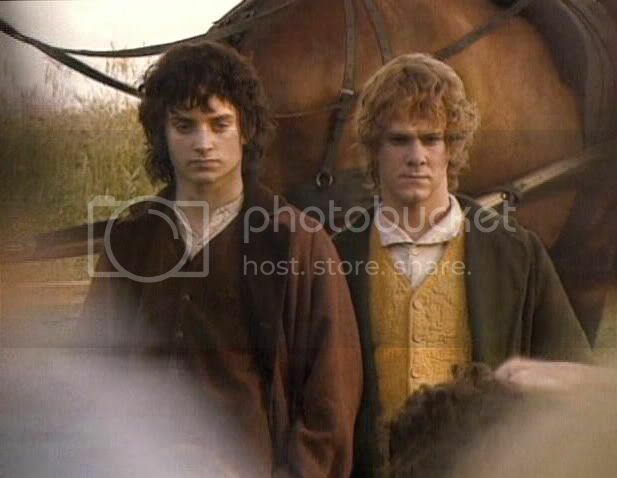 Again, although they were just posing for stills, they were posing in character. I think it shows. 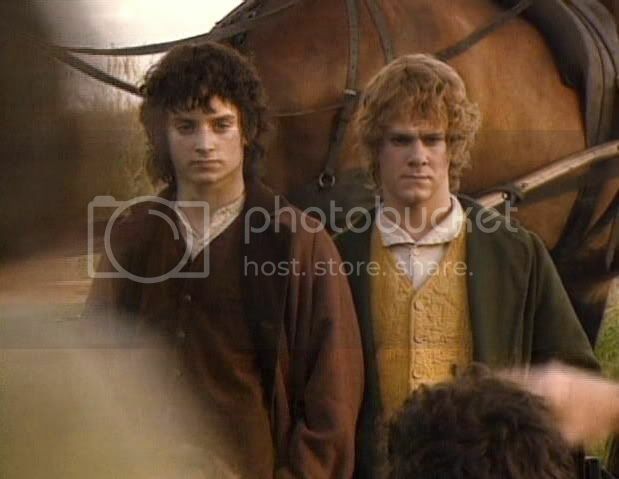 When I look at this sequence, the attitudes of both of them seem rich with a sense of inwardness and memory. 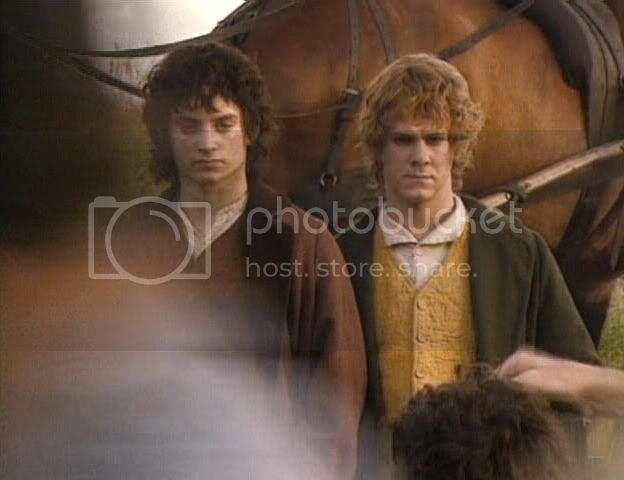 People inadvertently walking in front of the camera lens create blurs that give me the impression of the fading in and out of their mental images. 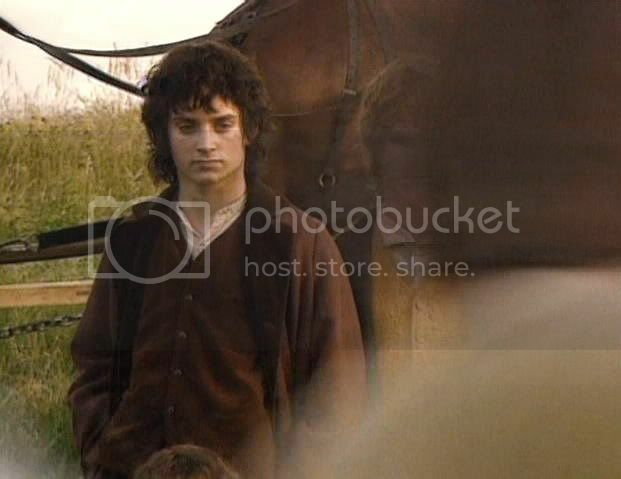 I look at Frodo’s face and picture his memories shifting and moving before the eyes of his mind, the first slipping away before the next edges into view, just as our view of him shifts because of the obscuring blur of the person moving in front of the camera. It's as if we get to see bits and pieces of memory moving through his mind. Bits of memory that are not happy, but full of melancholy and regret, even bitterness. 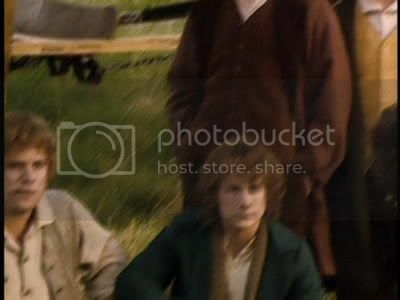 In this series, I even appreciate the lack of camera focus, the blurred quality. As I scroll through them, they remind me of old photographs of soldiers young soldiers in the American Civil War, a bit darkened and worn with age, like pictures found pressed between the leaves of an old book. Mariole, did I tell you I love that icon? Is that the one Maeglian did for the Harem, when the Ripper is giving him *therapy*? P.S. 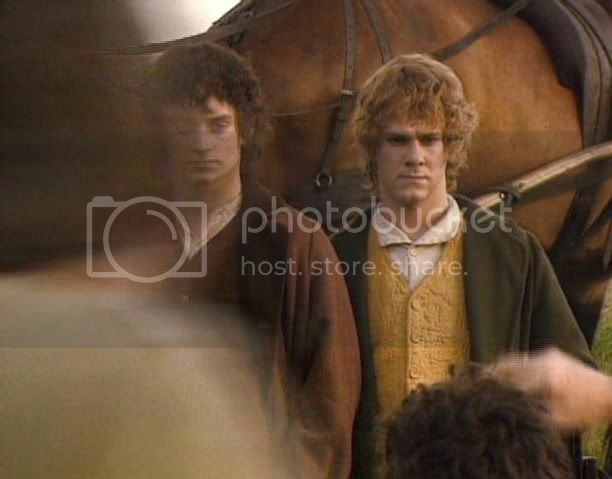 I am having a lot of trouble with LJ.com today; it's being very sluggish and giving me, "this page cannot be displayed," every other time. Has that been happening to you? LJ is indeed giving me static today. I got both your comments, even if you only posted one. So they might get through even if you can't post them; go figure. It's good to know who is getting Frodo off. He has so many admirers! I'm so very glad to be back; just a breathless week of harsh deadlines. It didn't help my health either; fighting a cold. Hi, I just started to open my recent entries, just in case anyone responded. I haven't had any email notifications since things at LJ.com began to go kerflooey over the weekend. I noticed browsing Ariel's f-list for any news that Hybridutensil said she/he hadn't been getting any email notices. 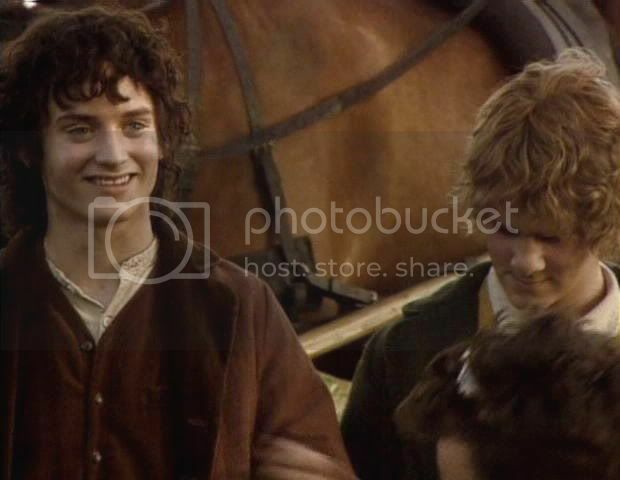 Yes, one can't have too many orgasmic Frodo shots.